How Do I Clean My Down Pillows? So you have the perfect pillow, the best combination of soft and support, but you (and maybe the dog) have been sleeping on it for the past 6 months. Hair oils, perspiration, and dust mites do accumulate during use and you feel that it’s time to freshen it up. What to do? If you like to “do it yourself”, first read the care tag that is attached to the pillow. Then inspect the ticking carefully to make sure there are no tears or loose seams. If it is safe to wash the pillow, use a non-agitating or front load washer. Wash two pillows at a time, to balance the load, using only a small amount of neutral detergent and no bleach. If available, use the extended extract cycle. 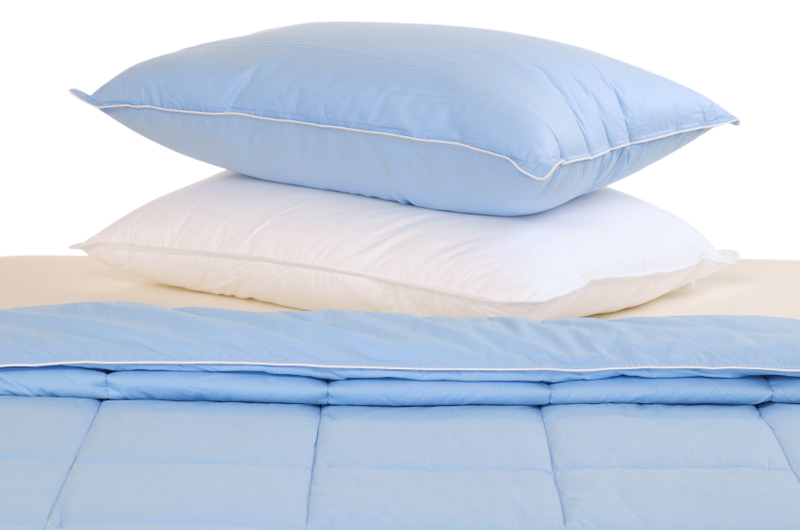 Dry your pillows thoroughly on med to low heat in a large drier. Expect it to take at least an hour. Adding clean tennis shoes or tennis balls to the drier will help fluff your pillow faster. Be certain it’s completely dry or mildew can be a problem. Or…take it to your professional dry cleaner and ask if they have a pillow cleaning machine. A pillow cleaning machine sanitizes and deodorizes the feathers using ultra –violet and ozone light bulbs and discards any foreign particles into a catch basin for disposal. Then you nice clean feathers are blown into a new pillow ticking and returned to you as good as the day you bought it.